NASA/FlickrEarth is a, like, 12,741km-wide rotisserie chicken. The vernal equinox of 2018 passed at 3.15am, AEDT. Earth’s rotation does not cause equinoxes. Equinoxes occur when Earth’s tilted axis is perpendicular to the sun’s rays. During an equinox at Earth’s equator, the sun appears almost directly overhead. 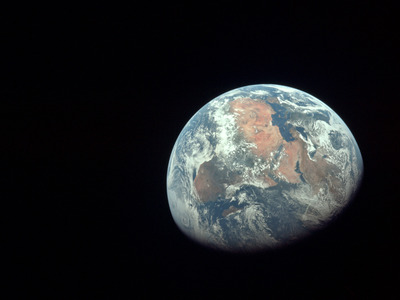 The year’s vernal equinox, also called the March or – in the northern hemisphere – the spring equinox, fell this morning at precisely 3:15 AEDT. For those in the southern hemisphere, though, it’s now autumn: The days are growing shorter, the weather is cooling off, and sunlight is growing dimmer as winter approaches. Technically, two things: Earth’s tilted axis and the planet’s orbit around the sun. That tilt is about 23.5 degrees (for now) and bathes different parts of the world with various intensities of light over the course of a year. Meanwhile, the planet’s rotation keeps the heating even, sort of like a 12,741km-wide rotisserie chicken made of rock and a little water. Shayanne Gal/Business InsiderAn illustration of the vernal equinox. But this moment won’t last as the Earth makes its way around the sun at a speed of roughly 107,182km/h. 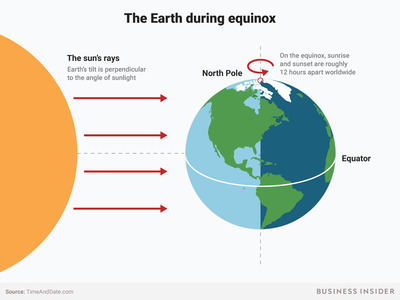 About 92 days and 19 hours after the vernal equinox, the Earth will reach its winter solstice, or when the most direct rays of the sun are reaching their northernmost latitude, called the Northern Tropic (or Tropic of Cancer). Another 93 days and six hours later, the spring equinox will occur. 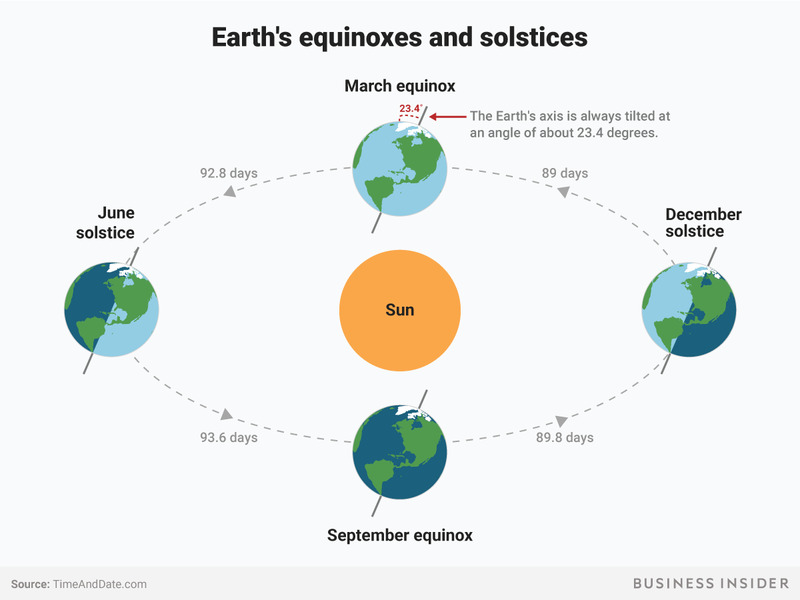 Then it’s another 89 days and 19 hours to the summer solstice – when the most direct sunlight strikes the Southern Tropic (or Tropic of Capricorn) – and another 89 days to get back to the vernal, or autumn, equinox. Shayanne Gal/Business InsiderAn illustration of the spring and fall equinox and the summer and winter solstice. And don’t look for any gravitational interplay between Earth and the sun to help you out; it’s far too weak to make a noticeable difference.